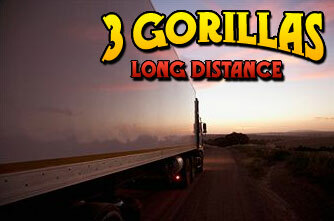 3 GORILLAS MOVING and STORAGE, based in Tucson, AZ. Combining fond memories of working as a teenager on moving vans along with his unmatched promotional background, his ceaseless drive and commitment to excellence has gained the company a highly respected position in the Tucson moving services market. He recently acquired a brand new 5,000 sq. ft. warehouse along I-10 in southern Tucson. He was granted the exclusive southeastern Arizona agency appointment for National Van Lines, Inc., a long established; Illinois based long distance worldwide van line. This has allowed Emerson to expand his operations throughout the entire United States including Hawaii and Alaska, as well as internationally. He recently received military approval for his agency and warehouse, enabling him to employee over 20 Tucsonans in the performance of moving, rigging and storage services for US military personnel at Davis Monthan Air Force Base and Ft. Huachuca in Sierra Vista, both domestically and overseas. By sharing your experience with 3 Gorillas Moving and Storage , it will help other customers to make a right choice of using this company. Final bill was over 200% more than estimate. Company has an F rating from the BBB. Do your due diligence on this company. This has been the worst experience I have ever encountered.